* A frequent assumption in economics is that the coefficient that is being estimated is constant throughout the population. * That is, the effect of the exogenous variable is the same for all individuals. * Because B is assumed to be constant for all individuals. * However, let's for one second imagine that we are not estimating the constant B, but rather a random variable b. * This immediately presents an obvious problem. * What do we want to know from this formulation? * One problem is that for however many observations we have, we have the same number of bs, thus we cannot hope to estimate the individual b values. * 1. What is the average effect of X on Y? Ie. E(dY/dx|X) which is really what we are after assuming constant coefficient. * 2. And how much variance exists in b? * Where B is the average cofficient and v is the random component. * Now, we can easily show that given E(v|x)=E(e|X)=0 OLS is unbiased. * However, OLS is no longer the most efficient estimator of B any longer (because the homoskedasticity assumption is violated). * I want v and u be drawn from a multivariate normal which allows for them to be correlated. * We can see OLS works "fine"
* This is a form of heteroskedasticity. * So, we would like to do both 1 and 2 above. * but also the variance of the error terms which is u and which is v.
* In order to do that we will first define the NormalReg. 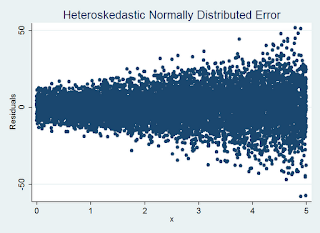 * That is the regression MLE form assuming the errors are normally distributed. * In this case it is the log of the normal density asking Stata to choose the optimal mean and standard deviation. * I have opted to program the pdf of the normal in the equation rather than the build in normal pdf command. * I am using sigma squared rather than sigma as the primarily form of the variance to be modelled. * This choice is not trivial. * The first thing you are probably wondering is "why am I using a model that only has one error term when I really want to learn about two error terms?" * The answer is that, as seen above, the sum of the error v and u can be expressed in a single form e.
* This conviently is a linear form that can easily be included in the above equation. * Looking back at matrix C we can see that our coefficient on varu corresponds well with the variance of u. * Our coefficient on x2 approximates our variance of v.
* But our coefficient on x is way too large for our covariance terms. * This is expected, the coefficient on x is supposed to be twice as large as the cov(v,u) from the formulation of the var(e) term. * In order for the MLE estimator to be efficient in this case we are assuming that both v and u are normally distributed (which they are because we generated them). * We may also be concerned that the generated covariance maxtrix Chat is not Positive Semi-Definite, a requirement for v and u to be jointly multivariate normally distributed. * In this case there was not problem inverting Chat. But this need not be the case. * Let's try simulating some outcomes for a matrix a hairs breathe away from not being PSD. * We can see that in this formulation only about half the time is the covariance matrix PD. * This could present a problem. * There are various ways of trying to correct for this. * All of them require more advanced programming than I currently understand using the MLE syntax. * I hope/need to learn how to make such corrections in the near future. * Note, Stata is already doing some clever behind the scenes manipulations to make sure only feasible values of the parameters are chosen. * Stata must ensure that sigma >= 0 for the psd (because it is taking the square root). * Note that because I was able to specify simga directly I have already multiplied by the constant 2 causing the cov estimate to be scaled properly. * This new specification is guaranteed not to create covariance matrices that are not positive definite. * However, it frequently fails to converge which means that it is really not a very good algorithm. * I will continue to experiment with this problem in the near future. * This next step is using a Cholesky Decomposition to pre-specify the variance matrix (as suggested by my advisor Jeff Wooldridge). * I will post more on that as I make steps forward. * Also, if anybody knows any built in commands in Stata that can do this, please post them. * I have used xtmixed previously to identify random coefficients. * However, I think the command imposes orthogonality on the random coefficients. congratulations to your blog - it's very interesting and useful. I'd like to comment on this post. 2. I think in terms of cross-variances it would be more interesting to think of correlations between random terms on coefficients of different observed regressors. Similarly to, say, discrete choice models like BLP, it might be of interest to see if "preferences" for different "characteristics" (different columns of x when there are more regressors) are correlated or not. This is probably more relevant than the correlation between the random terms and the unobserved error term, as it can tell something about the relationship between the observed variables. Of course, I guess identification depends on whether one has enough variation in those variables. 3. It seems to me that there is a problem in your second estimator (myNormalReg2). In the line you define the variance (gen `sigma2' = (exp(`var_u') + exp(`var_v') + 2*`cov_uv')), the expression is not a function of x and x-square. `quiet' replace weight=1/(fit^0.5) if fit>0 & fit!=. display "FGLS iteration `i', max. abs. difference in parameters: " %7.5f = `difference' ", # of obs. with inconsistent weight: " r(N) " (" 100*r(N)/_N "%)"
display "Difference of ML estimate from true VC matrix"
display "Difference of IFGLS estimate from true VC matrix"
Thanks for this thorough comment. 1. I have run your code and it definitely seems to be working in a superior fashion to the MLE. For some reason I thought that the MLE estimator was supposedly more efficient than the FGLS estimator. However, I seem to be wrong. I will follow up this post with another post simulating the results of both methods to see which one is less biased and has lower variance. It seems clear to me that the FGLS estimator definitely is faster. 2. I think that is a good point about the correlation between the random coefficients of variables. 3. I don't think I am mistaken about including the x and x2 term in myNormalReg2. I included it in the MLE ly syntax in order to maximize compatibility of the code. By specifying directly x2 and x into the above equations it tells Stata to include them in the estimation. The above must be specified or else the MLE would not be able to converge. I have a few more thoughts on the matter. I don't think IFGLS is more efficient (I know you did not say that but I suggested it) and as for the MLE being GLS, that is not the case. From Wooldridge's MIT book Chapter 7 he says that GLS is used when the variance-covariance matrix is "known". When it is not known, it can be estimated via methods as you purpose, FGLS. MLE is related. It just states that the variance is unknown and the coefficients are unknown and we are going to use the normality assumption to estimate them together.